Explore, discover and enjoy a unique taste of rural Africa! Idyllically located on the beach, Coffee Shack boasts one of the best locations in South Africa where you will experience a way of life far removed from Western culture. We have a reputation of being a fun, good-value hostel with excellent facilities and the most amazing, friendly staff. We offer accommodation in traditional, thatched-roof huts, ranging from private rooms to dorms, as well as camping facilities in the garden next to the beach. Choose between self-catering options or try our delicious meals with a free ‘potjie’ meal every Sunday night. Weather and ocean permitting, join us for daily sundowners with magnificent views or taste freshly caught oysters and mussels at the bar before dinner. Stay for five nights and get your 5th night free! Our ‘Babalaza Bar’ is fully licensed and rocks in the evenings with its free pool table and range of drinks and cocktails. Join in the Killer Pool game or enjoy the chilled-out atmosphere around the fire pit. 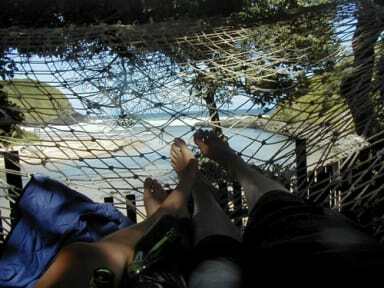 Our variety of day trips include cultural walks exploring the local Xhosa culture, a traditional evening of dance and song at the home of a local family where you can try traditional Xhosa food and beers, beach days on the beautiful Coffee Bay, surf lessons, exploring Mapuzi cliffs and caves, hiking to the legendary 'Hole in the Wall' or just walking in the local countryside with one of the local guides.